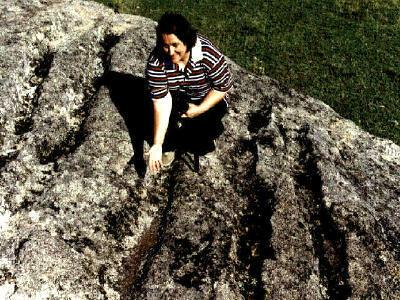 Deep in the New England hills in 1976, Heather and I investigated a granite-covered property. Scattered over an area of about 12 square acres we identified a number of huge menhirs, altars and other stone arrangements; the most impressive of these being a lengthy alignment of huge boulders, a megalithic temple and three circles, one being the largest we have found to date. The largest circle is actually pear-shaped, and stands on an open flat upon an east-west axis. The western end is marked by a large pointer stone, from where the Sun could be sighted rising in the east through a wide gap in the stones from the ‘pointer’, which actually forms the apex of the ‘pear’, as well as a triangular formation which makes up the western end of the ‘Pear-Circle’. Thirty-four stones form the ‘Pear-Circle’, which measures 120m in length by 60m in width. The triangular formation being 15.2m across its north-south base by 57.1m and 80.1m on its north and south sides respectively. The exact purpose of this great circle was finally worked out during 1999, when it was found that both the Summer and Winter Solstices [December 22nd and June 22nd respectively] sunrises were viewed and measured here. 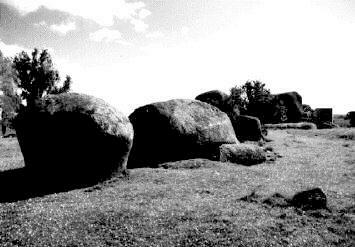 157.6m to the east lies the second circle, formed of ten massive boulders. It measures 30.9m east to west by 28.4m north to south, with a large, 4.6m long by 1.8m wide altar near the southern edge; and an alignment of three small stones spaced 6.7m and 8m apart on an south-east/north-west axis within the structure point beyond a 16.6m wide gap between two monoliths. The third circle, actually ‘horseshoe shaped’, measures 96.8m circumference, by 34.3m width east west, and 32.3m from north-south. Constructed of huge boulders, the centre is marked by one of these, and a large pine tree now growing beside it obscures the view. 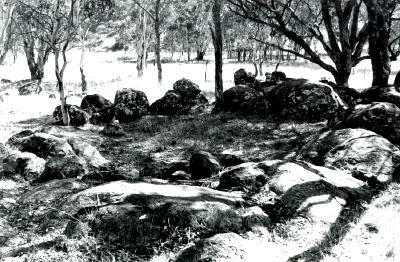 This 15 m wide circle of large granite boulders, found deep in the Moonbi Range north of Tamworth NSW, is identified by a nearby Uruan rock inscription as the "Temple of Nim the Sun". There is a 4.1m wide entrance between two boulders on the northwest side, and a 10.6m gap on the southwest side allowed the ancient astronomers to observe the sunset in the winter months from the large central boulder. Other stones on the eastern side were employed to mark the Winter Solstice. Some of the stones forming this circle average 3.7m or more in height by 12.4m to 22m and more in circumference, weighing 30 to 40 tonnes. The stone alignment consists of seven standing stones [one being a massive 40 tonne boulder], erected on an east-west axis to a length of 97.3m. 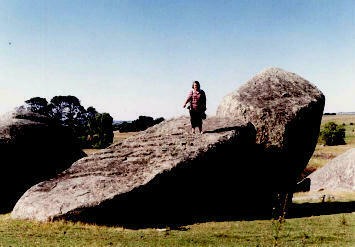 There is a 137m gap toward the east until a 3m tall boulder. Behind this facing west, lying broken in two is an obelisk-like menhir [standing stone]. Upon its exposed surface, which faced the east when erected upright, are nine deeply carved grooves several centimetres in width and depth and spaced several centimetres apart. The broken base measures 4.6m square and when intact and upright this huge menhir stood 15.3m tall. The purpose of the grooves, it is certain, was to catch and calculate the receding shadow of the rising sun. This menhir towered over the alignment, which has a total length of 328.7m. An observer standing some metres beyond the westernmost stone, would have lined up the rising sun with the ‘obelisk’ menhir at the Summer Solstice. The grooves on the menhir are now weathered with age. How long did this great stone collapse. South of the third circle stand massive stone blocks in a square formation measuring 30.8m by 16m; the remains of a temple. A corridor extends between the blocks along the structure’s southern side. Two large altars are found here. One measures 4m long by 2.1m wide and 90cm tall, with a 1.6m long by 37cm wide ‘pathway’ cut up the left side of the stone to the flat surface. This massive astronomical observatory is of considerable age. Stone tools of the Aboriginal ‘Capertian’ culture dating around 7,000 years BP occur here, suggesting the Uruans occupied the site before that time. “Ashar, God of the Sleeping Sun”. Ashar was the god of darkness and also death of this people. The “Archaic Uruan” script period dates between 25,000-15,000 years BP. Coupled with the degree of weathering of the monuments, I believe the New England ‘Stonehenge’ dates back even earlier, to at least 30,000 years. We would know a lot more concerning the astronomical knowledge gathered at these structures had even engraved records been left upon these stones. Perhaps these may yet turn up somewhere hereabouts to reveal more of the astronomical science developed by these ‘Australantean’ fair-skinned gods. The construction of this observatory required a truly massive workforce, especially in the transportation and placing of the many monolithic boulders making up so much of these structures; for the erection of these gigantic stones, many averaging 50 tonnes or more further demonstrates that the builders employed ancient technological skills still beyond our comprehension, and we can only conclude that this vanished, proto-Aryan people evolved a highly-sophisticated, astronomical science and technology, thousands of years before the rise of Mesopotamian, Middle-Eastern and European civilisation, which they influenced. How they created this great megalithic ‘mother’ civilisation in stone-age times, in a land otherwise populated with primitive hunter-gatherers, and whatever other achievements were theirs, we can only regard with awe.